“Hoppy” International IPA Day 2014! Happy, or should I say Hoppy IPA Day 2014! This day is dedicated to all of the fantastic IPA’s out there, from the piny and dry West Coast IPAs to the malt forward, juicy English Style IPAs, this day is all about celebrating our favorite hoppy guilty pleasure. IPAs are some of the most widely varying of styles, with aromas and flavor profiles all over the board, there is surly one for every beer lover out there. It is one of the most fascinating styles as well, with flavors and aromas that can be region-specific, the IPA is truly a global beer, with ingredients coming from just about every corner of the world! Craft Beer.com has a great article on why you should celebrate the IPA, among the reasons to celebrate IPAs today is the great history behind them! As a history teacher myself, I love reading historically relevant contextual reasons behind beers. The IPA was created not out of a want or desire for a bitter beer, but out of necessity! 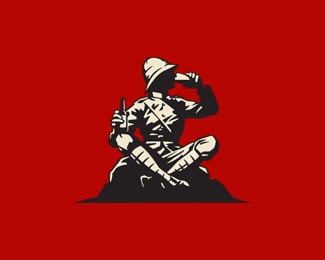 In the process of shipping beer across the ocean from England to other members of the British Empire, specifically India, the beer would often spoil before it got to its final destination! Think about it! This is before the days of modern refrigeration, so the beer would sit in hot, wooden casks, and by the time it reached the mouths of those longing for it, it was fairly atrocious! 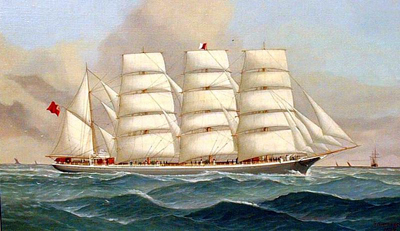 Beer would have been shipped on large British ships such as this. To combat this, the beer was aggressively hopped, usually if not always in the bottle to preserve it. Many people are unaware that the primary purpose of hops was preservation of the beer. It just so happened that people on the receiving end enjoyed the bitter flavor of the beer and thus the style of IPA began to bloom. For the past two years, hundreds of events, tastings, festivals and dinners have been hosted around the world in celebration of IPA Day. Last year, the official #IPAday hashtag was tweeted out 33,697 times by 22,877 different users. The #IPAday hashtag had the potential reach of 25.04 million people and appeared on nearly 54.2 million timelines. Throughout the day, the official hashtag trended in several major U.S. metropolises, including Austin, Birmingham, Baltimore, Boston, Chicago, Cincinnati, Columbus, Cleveland, Denver, El Paso, Greensboro, Harrisburg, Honolulu, Indianapolis, Jackson, Jacksonville, Los Angeles, Louisville, Minneapolis, Memphis, Milwaukee, Portland, San Antonio, San Francisco, San Diego—and just about every major U.S. city on the map. Outside of the U.S., reports of IPA Day were recorded all over Europe, as well as China, Japan, New Zealand, Australia and Brazil. The goal is to make this year’s IPA Day even more viral. Getting involved is easy! The only requirements are an appreciation for great craft beer and the willingness to spread the word. Anyone can participate by enjoying an IPA with friends, making some noise online with the #IPAday hashtag and showing the world that craft beer is more than a trend. 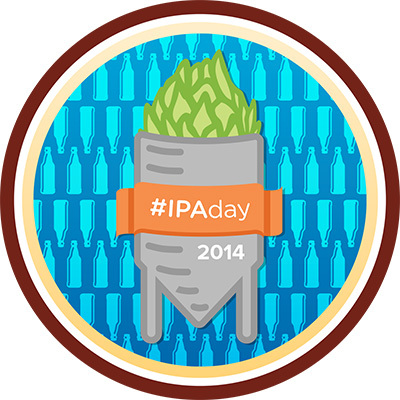 A favorite Craft Beer App of ours, Untappd, is celebrating IPA Day 2014 with a brand new badge today! All you have to do it check in to an IPA today and you are ready to sport your brand new swag and celebrate in style. So, how should you celebrate IPA day? Easy! Go out, and drink an IPA! Better yet, why not go to your local craft brewery and support their IPAs? Snag a hopped-up selfie and tweet us and make sure you tag your tweet with #IPADAY or #IPADAY2014! For your convenience, we have listed some of our all time favorite IPAs below!